Damian and I [Larry S.] have been talking about doing another impromptu observing session. 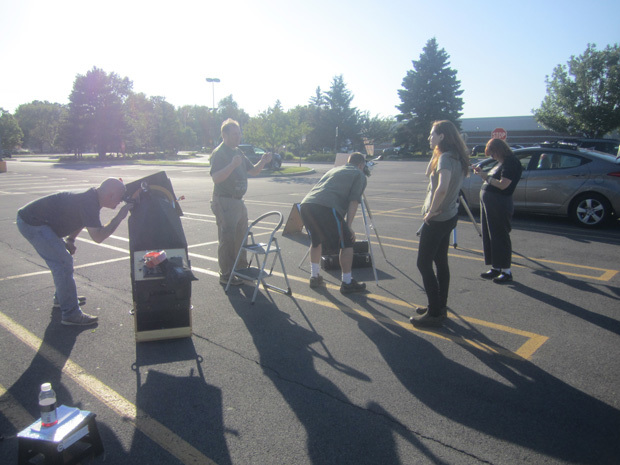 We had some really good turn out for a Solar/Lunar observing session in the Shoppingtown upper parking lot. Wednesday’s forecast is looking promising. Anyone interested in doing another Solar/Lunar session at Shoppingtown at 6pm on Wednesday? I’m choosing Shoppingtown again, because I have a CNY Skeptics in the Pub meeting at Scotch and Sirloin at 7pm. Any one interested in joining us for a drink after is also welcome. 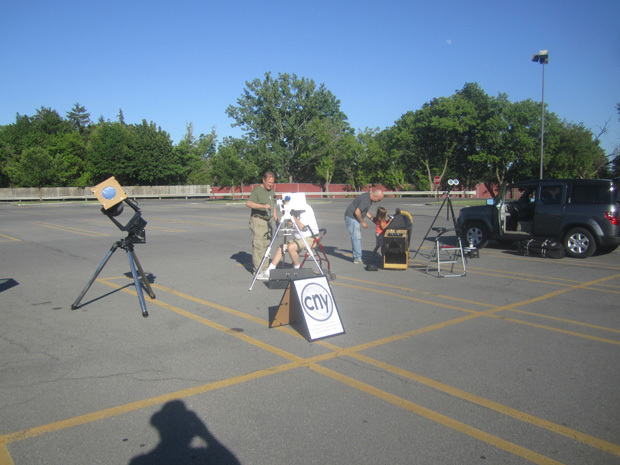 CNYO hosted a half-dozen observers (and a half-dozen or so other stopper-by’s) at its second facebook-organized combined Solar/Lunar Observing Session in the parking lot of ShoppingTown Mall on Wednesday, 19 June 2013, just prior to the bimonthly CNY Skeptics In The Pub meeting at the Scotch & Sirloin. In attendance were Larry Slosberg with both his NMT 12” Dobsonian (and my custom Baader solar filter) and his Meade SCT 8”, myself with Baader-equipped Zhumell 25×100’s, and John Giroux with his Coronado Solarmax 60 II (which obviated the need for me to bring my Coronado PST, providing a low-magnification Baader view for onlookers instead through the binos). This event also featured the first official use of our CNYO Solar Observing brochure, which we will continue to update and have available at all of our Solar observing sessions (download the PDF for yourself at its CNYO post). The 11 day old waxing gibbous Moon hung quite pale blue but feature-rich through Larry’s 8” SCT. Outside of discussion with attendees, all attention was placed on the Sun, which was busy with several sunspots and prominences, include Sunspot 1772, which featured a surface prominence easily visible in John’s Solarmax. A gif of the 5 days prior and 5 following days is shown below from NASA SOHO images (the image for the 19th is in yellow). From NASA/SOHO images. Click for a full-sized version. The Solar/Lunar Sessions are a perfect combination of interesting (and important!) objects and family-friendly observing times, making them one event we plan on committing to a more regular schedule this summer (with new potential locations under discussion). We will keep you posted on this website. Stay tuned!